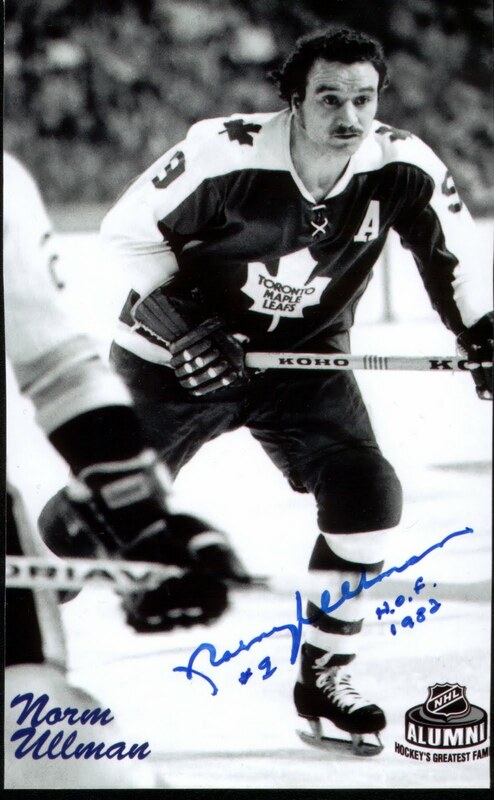 Just recently, I received autographs from two former members of the Toronto Maple Leafs. Both cards which I had picked up at the local swap meet were mailed away to Ron Ellis and Norm Ullman - and they both came back to me in less than a month. The beauty part of all this is that Norm Ullman was kind enough to include an autographed photo in addition to the card that I mailed away to him. That is a moustache that would make any Movember of the year list! 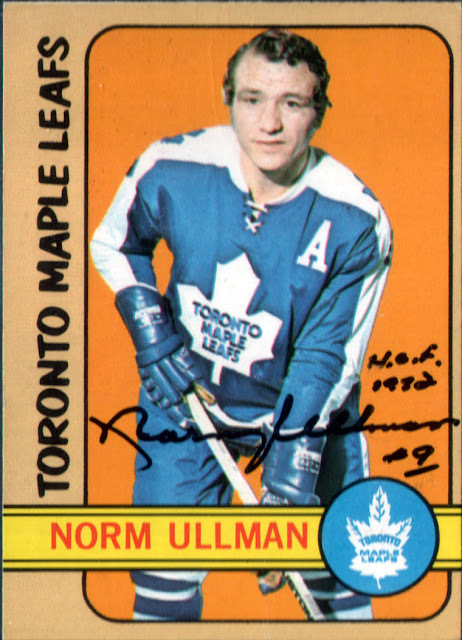 Norm Ullman was a great hockey player who also played a very long time. Add those two facts together and you get a player who has played a lot of games and scored a lot of points. Norm finished his hockey career playing 20 NHL seasons and 2 WHA seasons. 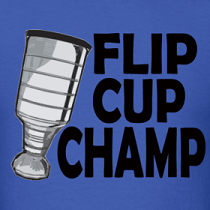 In his NHL career he was top 10 in goals 9 times and top 10 in points 8 times. Norm also had 16 seasons where he scored at least 20 goals. In 1976 at the age of 40, Norm scored 87 points in 77 games for the Edmonton Oilers. He is on countless top 50 lists for all-time games, assists, points, goals created etc. With this resume, he was a shoo-in for induction into the Hockey Hall of Fame in 1982. A great looking autograph which includes his Hall of Fame year and the number 9 which he wore during his time with the Maple Leafs. 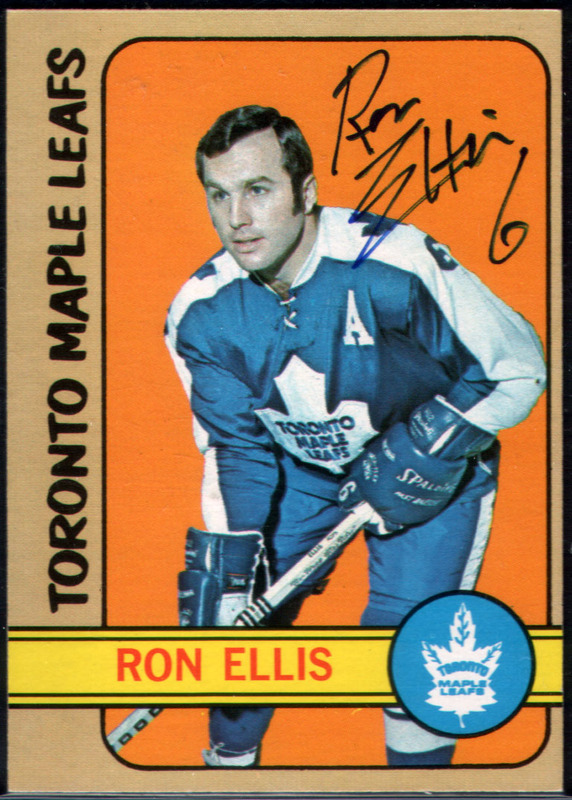 Ron Ellis had a very strong NHL career as well. Ron scored 20+ goals 11 times in his 16 season career which included a brief 3 year retirement at the height of his career. 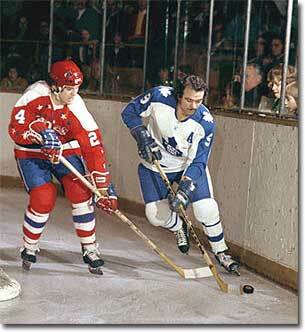 Ron would finish his career with 332 goals, 640 points in 1034 games all with the Toronto Maple Leafs. Ron is currently a director with the Hockey Hall of Fame and also is a part-time public speaker. Ron travels speaking about mental health which is something I see as being extremely important to society. As someone who was diagnosed with clinical depression, Ron found the strength to overcome his illness and uses his celebrity to help spread the word about mental illness. I see this as being both brave and important as I, like many others, have family members who struggle with mental illness and the stigma that is attached to it sometimes is as debilitating as the illness itself. Having people like Ron Ellis educating the public about getting tested and treatment for these illnesses is a message that we all need to hear! Ron’s auto is done with a blue sharpie that includes the number 6 which he wore for most of his career. Love that Norm Ullman signed H.O.F. 1982 on his card. Are they worth a lot of money? Not as much as if they would have been the OPC versions. Unautographed they are worth a couple of bucks a piece. With the autos on them they are probably worth about 10 bucks a piece*. Oddly enough, someone on eBay has posted a similar Ullman card which is also autographed but the auto is different than mine. It's crazy that cards so old are only worth a few bucks. You would think it would be more. You got that right Derek. You can actually pick up the whole 72-73 Topps Set for a mere 400 bucks if you look hard enough. The OPC version is a little more rare and larger so it will cost you more like 1500 for the set. Collectors on limited budgets usually try to get the old topps sets over the opc's because they are a better value. For example you can get a graded "8" topps Gretzky rookie for $450 on ebay where an "8" O-pee-chee version is closer to $2000 dollars. Fact is there are fewer OPC's out there and collectors seem to want to a pay premium to get them so as a result they are "valued" higher. To me personally, I think Topps or OPC Gretzky rookies are equally desirable....but, that is just me! I use to always buy Upper Deck hockey cards in the 90's because I thought pro set and the score sets would be worth less one day. Was I right? Also huge fan of this site. Love the funny posts and the wax stain posts. I catch up on all the posts every Friday at work. Not a bad choice, all of the sets from the 90's dropped in value over the last decade. Upper Deck has held its value the best when compared to many of the others which a few exceptions (90-91 OPC Premier and 92-93 Bowman). I have always preferred the quality of card that UD made in those days as well.